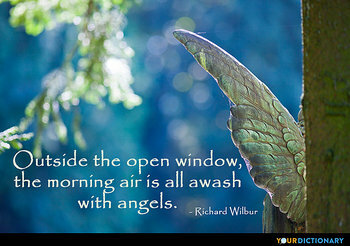 Outside the open window, the morning air is all awash with angels. Football is the most important thing in my life, but I do have a life Outside football and this is one part. The TV, the music, the fashion - it all goes to make up Rio Ferdinand. At the ballet, you really feel like you're in the presence of something Outside the rest of your life . Higher than the rest of your life. There is no entering into salvation Outside the Church, just as in the time of the deluge there was none Outside the ark, which denotes the Church.  Thomas Aquinas, 1265–1274, Summa Theologiae.